Galerie Durand-Ruel, Paris, by whom acquired from the artist on 22 January 1913. Anonymous sale, Hôtel Drouot, Paris, 28 May 1952, lot 100. Anonymous sale, Hôtel Drouot, Paris, 26 June 1986, lot 57a. Acquired at the above sale by the present owner. 1992, no. 190 (illustrated p. 190). Ar Men, no. 57, July 1994, p. 70. J.E. Grossvogel, Claude-Emile Schuffenecker, Catalogue raisonné, vol. I, San Francisco, 2000, no. 31 (illustrated p. 12). Pont-Aven, Musée de Pont-Aven, Emile Schuffenecker, June - September 1996, no. 30 (illustrated in the catalogue). In 1872 Claude-Emile Schuffenecker joined the stockbroking firm of Bertin in Paris as an accountant, where he met and befriended his colleague Paul Gauguin. They shared a common passion for art, going on trips together to the Louvre to study the works of the Old Masters. Schuffenecker took drawing classes, socialised with his artistic contemporaries, including Armand Guillaumin and Camille Pissarro, and made his Salon début in 1874. When the stock market crashed in 1882, Schuffenecker abandoned his financial career to devote himself entirely to painting. As one of the co-founders of the Salon des Indépendants in 1884, he befriended Georges Seurat, who would have an important impact over his artistic style for the remainder of that decade. Despite Schuffenecker's close relationship with Gauguin and members of the Pont-Aven group, his artistic sensitivities were much more in harmony with the Neo-Impressionist theories and technique developed by Georges Seurat and Paul Signac. Schuffenecker's interpretation of the pointillist technique resonated with his desire to reflect in art the ephemeral yet divine nature of the world as a symbol of the human condition. Schuffenecker's most accomplished works in this style date from summers spent at Étretat and Yport on the Normandy coast from the mid to late 1880s, and the present work exemplifies how he successfully adapted this technique to express his own personal vision. Greatly inspired by these coastal towns, he gloried in the play of light over the cliffs, the sea and the sand. 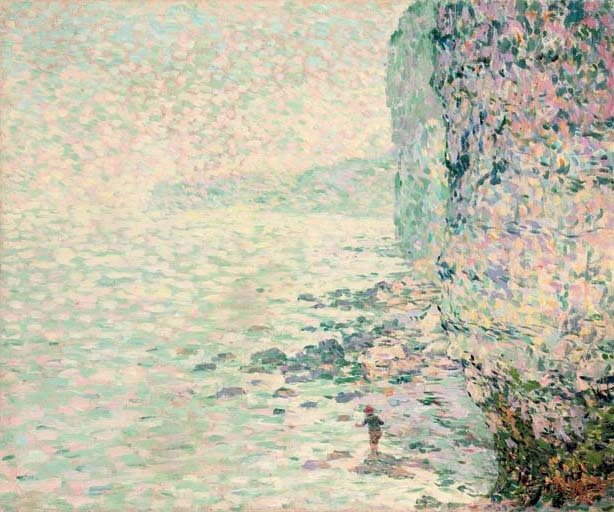 The dramatic perspective in Falaises d'Etretat places the viewer by the cliff wall looking outwards over the shimmering sea, a bold splash of red on the cap of the young boy perched on a small rock announcing the only human presence. In this striking composition, Schuffenecker employs his usual palette of light greens, blues, purples and oranges, but suffuses it with white pigment to heighten the ethereal effect. Count Antoine de la Rochefoucauld, art collector, patron and artist, described Schuffenecker's approach: 'He, who more than anyone has a perpetually agitated soul, has created works of sheer joy. His soul permanently soars, and from where the dazzling, impulsive divine force reigns, he brings back artistic themes as subtle as the ether itself in which he has flown' (quoted in R. Porro, Claude-Emile Schuffenecker 1851-1934, Combeaufontaine, 1992, p. 128).